Just days after a fervent Tesla enthusiast's European road trip to show off his Model 3 ended after the car's "Autopilot" drove him into a median, new video emerged on Twitter this morning giving what appears to be an in-depth look at how Autopilot could be malfunctioning in a number of recent accidents. This morning, video was posted showing what is allegedly a Tesla in Autopilot mode having a bout of "confusion" when the road being traveled changes from a straight road past a section on a highway that offers an exit by the road dividing. The video appears to show the car unable to determine which lane to stay in and nearly hitting the center median that divides the roadway from the exit. The original video states that the car "dives" at the divider; it was released just days after yet another confirmed Model 3 Autopilot-induced accident was reported, one which Elon Musk won't be able to consign to bias by the media or by the driver, as the accident occurred in a car operated by a long time Tesla enthusiast and was reported by electrek, a website that has been Tesla's PR mouthpiece for the better part of the last couple of years. I'm just stating the facts in my post. My insurance is third-party only, which means I will receive no compensation for this collision. I am now calling a tow truck driver who will tow the car to Thessaloniki as it is not drivable. I will make further plans, most likely to repatriate the car back to San Francisco from there. I'm trying to stay positive guys, I'm so lucky to have had this opportunity to represent the EV community and movement, and so unlucky to have had this happen to me after driving without an issue through 25 countries. When he says that it hits the median at an “exit fork”, the accident sounds reminiscent of the fatal Model X accident on Autopilot in Mountain View where it confused the median for a lane. But in that case, Tesla showed that the driver had a lot of the time to take control. While using Autopilot, the driver always needs to stay attentive and be ready to take control at all time. As for You You’s accident, he makes it sounds like he had no time to respond as the car “suddenly veered”, but I have never seen Autopilot do that before. I am not saying that You You is lying, but it is certainly a strange situation. Also, it looks like he was driving late at night and has been driving for days. If it’s not a misuse of Autopilot and the system indeed “suddenly veered” into the median, then it might be the first example of Autopilot causing an accident, but I think we need to have the data logs before we get into that. You You put out the following Tweet to Elon Musk immediately after the accident. He has allegedly received no response, despite Musk having tweeted up a storm in the past week (instead of being on the factory floor all night as he said previously). You You later wrote on his Twitter that the Tesla "autopilot becomes pointless when you can't even look away for just a second, when your attention has to be more undivided then when you drive the car yourself, when your role becomes that of a beta tester risking your life to test a faulty software." @Tesla Autopilot becomes pointless when you can't even look away for just a second, when your attention has to be more undivided then when you drive the car yourself, when your role becomes that of a beta tester risking your life to test a faulty software. This tweet was followed by additional ones, in which the (former) Tesla enthusiast charges Tesla with not doing enough to address the problem especially since he is now facing significant out of pocket expenses. Two Americans are dead and one is injured as a result of Tesla deceiving and misleading consumers into believing that the Autopilot feature of its vehicles is safer and more capable than it actually is. After studying the first of these fatal accidents, the National Transportation Safety Board (NTSB) determined that over-reliance on and a lack of understanding of the Autopilot feature can lead to death. The marketing and advertising practices of Tesla, combined with Elon Musk’s public statements, have made it reasonable for Tesla owners to believe, and act on that belief, that a Tesla with Autopilot is an autonomous vehicle capable of “self-driving”. Consumers in the market for a new Tesla see advertisements proclaiming, “Full Self Driving Hardware on All Cars.” They are directed to videos of Tesla vehicles driving themselves through busy public roads, with no human operation whatsoever. They see press releases alleging that Autopilot reduces the likelihood of an accident by 40%. They also hear statements like “the probability of an accident with Autopilot is just less” from Tesla’s CEO, Elon Musk. Or they hear him relate Autopilot in a Tesla to autopilot systems in an aircraft. Such advertisements and statements mislead and deceive consumers into believing that Autopilot is safer and more capable than it is known to be. Tesla Autopilot - and this incident in particular - were recently discussed on a podcast over Memorial Day weekend, where analysts Chris Irons of Quoth the Raven Research and noted Tesla critic Montana Skeptic reviewed the details and the company's response (starts at about 27:17 in). 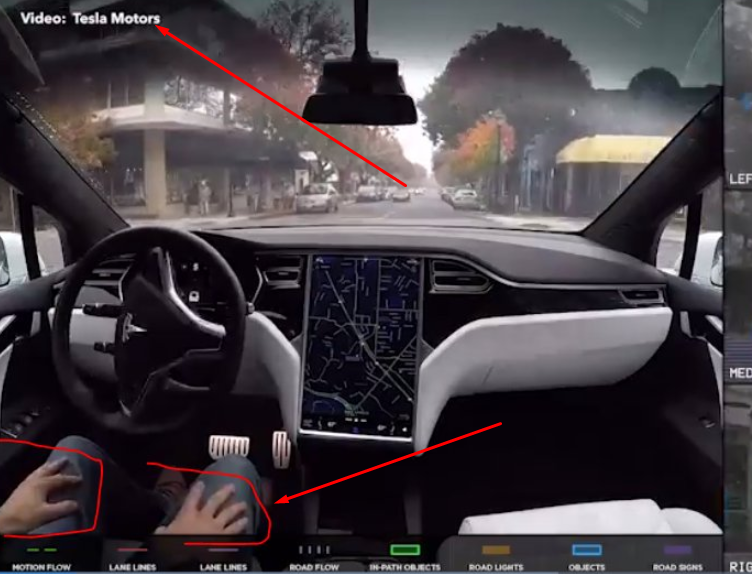 Electrek and Tesla have been taking a very "matter of fact" tone that the driver needs to be especially alert when Autopilot is on, despite Tesla videos put out by Tesla themselves showing a driver with Autopilot engaged and his hands off the wheel. Judging by You You's statements about his recent experience, it doesn't just seem that Autopilot is being marketed incorrectly; this "amenity" may in fact represent an extra liability to the driver given Elon's comments. In fact, why doesn't Tesla just completely deactivate the erroneously named "autopilot" feature indefinitely until the company stops, in You You's words, letting humans risk their lives as beta testers to experiment with what is clearly faulty software. At this point one wonders how many more accidents will it take before the company stops blaming driver for chronic "autopilot" crashes, and how many more injuries and/or casualties will regulators need to document before taking action?